Last weekend all our staff was busy going over the tracks from Eminem’s last record. We already started jotting our reviews and will be posting them soon. Check out the first one on the list: a review of the new “Kamikaze” album from Eminem.Pro editor, Ekaterina Malik. I bet, that the last word that associates with Eminem’s name is normality. Shocking, outrageous, insolent, cocky, maybe even crazy-yes, but normal? Well, yes, he is. In Revival album we saw a mature, grown up, calmer Em. Someone loved it, someone didn’t. People had all kinds of reactions. Some fans said he lost it, some argued that he gained a lot as a person and as an artist. He was scolded, was praised, accepted by ones, denied by others. Many fans had a hard time adjusting to their unexpectedly matured idol. 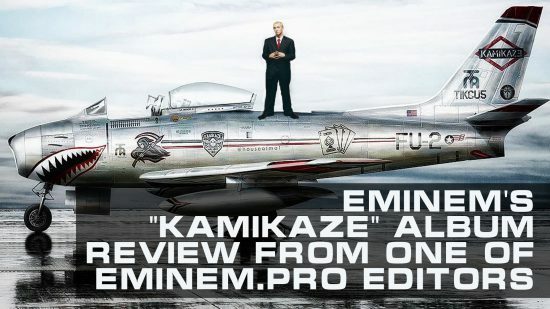 The “Kamikaze” album might be a good way to reconcile old fans with this new Eminem. Nostalgic sounds of the recording have merged naturally with the new Marshall. We hear Shady, but where’s the madness? It’s gone. The range of emotions in his new work is amazingly relatable even for the most normal of us. Yes, there’s still a lot of anger. But Slim’s irrational fury has transformed into a justified reaction to external events. He reacts to changes with anger and pain, he doesn’t like the way things are in hip-hop culture now. Doesn’t it make him look like nearly any adult speaking about the younger generation? It’s a debatable question, whether he’s right or not. All I’m saying — I can totally understand it. He is just not ready to go yet, not willing to give up his place in the industry, and he is ready to fight for it. The album is full of feelings that are easy to understand. He protective of his daughter, defends his status, openly speaks about his desire of a normal relationship. If Revival was a therapy album, “Kamikaze” is an attempt to find the way back to himself, it’s a closure and a new start. Eminem has a lot of edges, he compares himself to a Rubik’s, so I’d say this album is an endeavor to solve all his sides, to find a balance between Slim Shady, Eminem and Marshall. He lets go of his emotions this time: he disses, he praises, he says sorry, he reminisces and he hopes. All of this creates an astonishing picture of… normality. Each of us can recognize his or hers emotions and experiences in these tracks, but only if you bother to listen carefully. We all get angry and frustrated. We all sometimes can’t cope with colleagues and competitors. We are definitely, very often furious with people, who dared to harass our loved ones. Each of us have been fighting with changes at least once. And I’m sure that every person is really sorry and ashamed about some of their actions in the past. People are full of remorse and are willing to fix things. Today’s Eminem is closer to the listener than ever before. From a controversial figure he has turned into a human, who is easy to be associated with. A man with problems that people can understand. An artist who was able to grow up together with the generation of his fans. A person, fighting his own self for existence. “Kamikaze” is an anthem of normality and human nature. And for those, who are not interested in introspections — it’s also great music by an undoubtedly talented artist.